Ya Gotta Have Goals For 2016! For some reason, people like to hear about goals authors set for themselves. I don’t blame them. It’s interesting to look on the other side of the fence like that. But! Here’s the thing . . .
People follow people for specific reasons. It could be because they’re interested in an author’s life, what a lead singer is having for lunch, or whatever. There’s countless reasons to follow some one of interest. So, yes. This is my writing blog/website. It’s devoted to my writing. But I am, believe it or not, a real person. With real problems and concerns. And I even like to do things outside of writing. GASP!!! Heaven forbid an author do ANYTHING except write all day every day! Yeah, well, get over it. Anyhow, I thought I’d come up with a list of things I want to accomplish in 2016. They include things related to writing, but they also include other things also. Publish Komplex Sinplicities. If you read my blog before this one then you will already know that I have ordered my first proof for the paperback. There will be an eBook version to go along side it as well. Buy a vehicle. This one we did already. I say we because me and my wife don’t make those kind of decisions alone. Besides that, we may both drive it, but it’s really for her anyway. Work on my other writing projects. I have so much stuff to get out it’s crazy! I can’t just work on one thing. My mind doesn’t work like that. So I bounce from project to project. Work on illustrations. I have cover art and ads to work on, but I ALSO have a book project that will be illustrated almost like a children’s book would be. But this is no children’s book. I also have a comic strip type book I want to work on. Only time will tell. Publish one other book with eBook and one eBook. Talking about a challenge! This may be easy for some people to do, but not everyone has that kind of time! Again, only time will tell. Metal detect more. Until last year, I slacked off from my metal detecting. And that, my friends, is a real shame! So I plan on doing more of that and maybe some bottle digging. I have a sifting screen that I’m gonna put to more use this year too. Upgrade to a better metal detector. I’m more eager to do this than I can express with words! I’m looking at getting the Garrett At Pro and grab myself a NEL Tornado coil to go with it. It’s PAST time I found those deep targets that’s been out of my reach this whole time, dang it! Take a trip. Due to life and all that, me and my wife haven’t had the chance to really go anywhere in the last year or two. So this year I’m looking for us to take a trip. We know where we want to go, but it’s going to be a while yet before we are able to. It is what it is, I guess. Make some videos. I have a camera, not a very good one, mind you, but I have one all the same. Whether it’s metal detecting videos or videos about writing, I’m looking to throw some up on Youtube. If you have any ideas for some, let me know! The usual crap. Every year I tell myself I’m going to lose some weight, eat better, and blah blah blah. Well, I did lose about twenty five pounds last year. Don’t ask me how I did it, but I did! But my #10 goal(s) are just the usual things we all say we’re going to do every year, but end up not doing. And there ya have it! My personal top ten goals for 2016. It’s not everything I want to accomplish this year, but it’s the ones I think you would be interested in knowing about. So tell us what goals have you set for yourself this year in the comments below. And tell us how you’re currently working towards them. Until next time, and as always, have an awesome day! It has been one long and tedious journey to even get to this point: Ordering the first proof for the paperback. Whoo hoo! But, we’re not out of the frying pan just yet. There is still plenty of work ahead. With that said, I want to go over a couple of things about where I am at right now with my writing. Firstly, let’s go over what will happen once the proof arrives. So the files look good and the eBook files are waiting for their upload. It has been my experience, being this is my first paperback, that publishing a paperback is a whole different baby than doing eBooks. In short, eBooks are formatted differently. You only need a front cover where as you need to create the spine and front and back covers for the paperback. The paperback cover has to be tweaked to meet the page count. The interior is also different. Paperbacks are just that . . . paperbacks. Which is to say you are printing a physical book. So when formatting for this you have to think more traditionally. On the flip side of this are the eBook files which are HTML and look different on digital devices. although there is a lot of freedom with what all you can do with digital files there are some things you’re going to have to sacrifice in order for the book to look right on a person’s reader. Another thing to think about are pictures, links, and so on. Of course, in a paperback these things are printed on the page wherever they are in the file. Not so with eBooks. However, links can be clicked in digital files which will take the reader where ever you want to take them; website, landing page, etc. Most people already know these things, so I’m not going to go into formatting details here. Secondly, as stated before, the work isn’t over yet. Once the proof arrives it will need to be thoroughly gone over and looked at with the attention to detail of a forensics lab. How does the cover look? Do the images (live elements) fit? Are they cascading too much one way or another? Are they off kilter? Too short on any side? How is the image quality? Is the text clear and readable? Are the pages starting on the correct page numbers? Is the text aligned properly? Is there any weird spacing anywhere? After reading the book from cover to cover, were there any grammatical and punctuation errors? After going over every inch of the book, corrections will be made (if there are any and there probably will be) and the files will be re-uploaded. Should that be the case then another proof will be ordered and the cycle repeats itself. Once everything is fixed and finalized then comes the heart pounding moment when you push the Publish button. But hold on a minute! Are you promoting? Do you even have a marketing strategy? This should have been worked out a long time ago. If you don’t or haven’t promoted yet then don’t release that book into the world just yet. You need a following! I’ve got my marketing strategy laid out. It may not be the best of them, but I feel it will be good enough. It’s not like I’m looking to be the next J.K. Rowling. I just want people to read my stuff. Anyway, moving right along . . . . So what’s to be expected after Komplex Sinplicites? Well, I plan on writing a blog post just on this topic; and maybe soon. But, for now, I’ll just say there are several other projects in the works. The hard part is is there are so many of them. Writing takes time and, sometimes, focus. I’m a fairly busy guy! And there are a lot of times when I just don’t feel like writing for whatever reason. Hey! Writers are people, too, you know! In conclusion, I’ll keep doing what I do when I can find the time to even do it. The first proof, again, is on its way. I’m already working on other projects. And I’ll start throwing on the thick promotion stuff soon. In the meantime, thank you for your readership! And stay tuned for future updates by clicking on the Follow button. I hope to see YOU on the other side! After two months of my laptop being down for the count it’s working again. Unfortunately, the problem came at a bad time. I wasn’t able to work on Komplex Sinplicities, and thusly missed the Thanksgiving deadline. So now I have to pick up where I left off, obviously. I have yet to set a new deadline, but another holiday is just around the corner so we may be looking at around Christmas. Why wait until Christmas? Well, why not? Besides, it gives me time to do what I need to do and something for shoot for. Works for me! Anyway, I apologize for the delay folks, but rest assured I’m doing my best! Keep an eye out for future updates, and thank you for your patience! Something that interests me about a book is what interests a lot of readers and that is how the author ever came up with the story. Where did the characters come from? What was their inspiration(s)? I know, in terms of traditional book publishing, there is an arsenal of people that take an authors manuscript and turn it into the finished product we see on the shelf. Sometimes they change bits of the story in a way that will sell more books, and the original title may even get changed for much of the same reason. The cover of the book may have been one of thirty or more possibilities before being decided upon. All of this work goes into getting the most out of a book so that it makes a lot of sales. In the world of the Indie author, this team of professionals isn’t available; making the author, not only the author, but the editor, publisher, graphics designer, marketing agent, and so forth. Also, a word about covers, self publishers have the access to sites that specialize in book covers for a fee. these covers are well thought up, well made, and often look like they came from a big publishing house. But I like taking a more hands on approach. I’m no graphic designer, and certainly no where the level as many of the Photoshopers out there, but I can do enough to make an interesting picture or two. To be honest, some of my more cooler pictures I’ve done turned out the way they did by total accident. I start playing around and eventually I get this nifty picture. It’s fun. I enjoy doing it. So I make my own book covers. My best and most favorite is a picture I did that I’ll be using for one of my current WIPS (Work In Progress). Want a hint: There’s a bird on it. You’ll know it when you see it. For Komplex Sinplcities, which I’m finishing adding content to before going into the long editing process, you’ll see a red background with wavy lines and a symbol in the middle of the cover. The wavy lines was one of those accidents I told you about. the original idea was to have just a solid red background with the title and name in black and nothing else. But that’s where the symbol came in. I wanted to add a simple, yet unique, item to the cover without it getting too busy. I thought long and hard on the title and tried to let my mind brainstorm with itself. Then one day, I had the idea to put a bio-hazard sign on the front. I decided on this because people associate the sign with death, darkness, fear, maybe chaos, confusion, and so on. But that wasn’t enough. 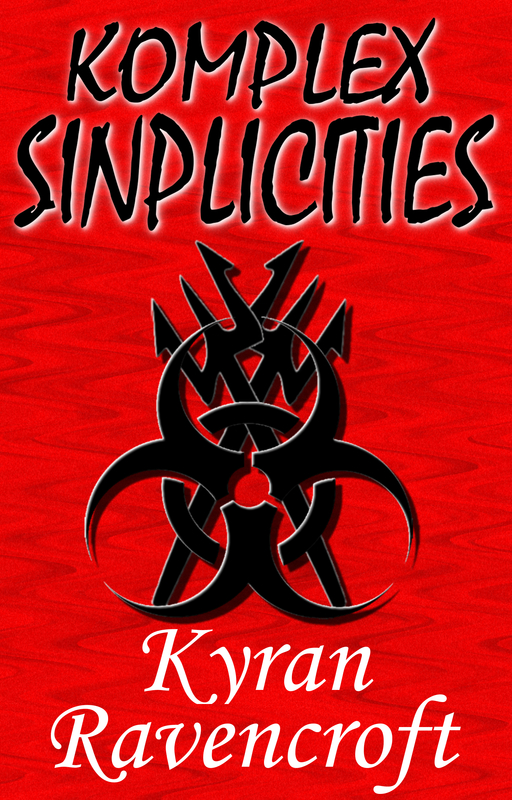 It fit the “Komplex” part of the title, but it didn’t fit in with the “Sinplicities” part of it. More time went by before the idea of adding pitchforks came to me. Crossing the pitchforks was the first thing I thought of doing, so I did this and placed them over the bio-hazard sign. That didn’t look right. So then I moved them underneath the bio sign. Still wasn’t sitting quite right with me. Then the idea of separating the forks and placing them on either side of the bio symbol hit me. I did this and tilted the prongs at an angle, but, like the other ideas, it was too space consuming and busy in the picture. So I thought on it some more. And the idea to cross them and put them in the bio-hazard sign hit me. I did this and angled them and stretched them so they fit evenly. Presto! There it was! I had my symbol. As for the title, Komplex Sinplicities, along with the other WIP I mentioned earlier, actually started back when I was in high school over twenty years ago. Being it was so long ago, I couldn’t tell you now exactly how I got the idea for the title other than I wanted something unique. Complex Simplicities seemed pretty fitting, but it didn’t have that “feel” I was looking for. I needed something that (mostly) my generation could associate with. So I changed a couple of letters and knew the words I was looking at was to be my book title. And after all these years, it has remained so. The cover itself, once I decided on the main look of it, has gone through many subtle changes. In terms of marketing and sales, there’s probably a version or two that would do better than the one I settled on, but oh well. But there ya have it! An in-the-nutshell look at how I came up with the cover to my upcoming book: Komplex Sinplicities. Be sure to follow my blog for future posts of news and inside looks into my books and how I came about creating them. Thank you for stopping by! Hope to see you next time!